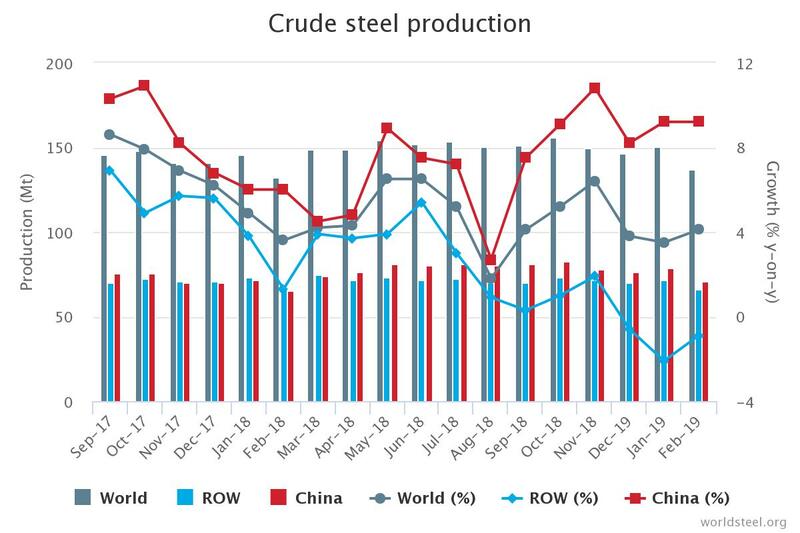 World crude steel production for the 64 countries reporting to the World Steel Association (Worldsteel) was 137.3 million tonnes (Mt) in February 2019, a 4.1% increase compared to February 2018. China’s crude steel production for February 2019 was 71.0 Mt, an increase of 9.2% compared to February 2018. India produced 8.7 Mt of crude steel in February 2019, up 2.3% on February 2018. Japan produced 7.7 Mt of crude steel in February 2019, down 6.6% on February 2018. South Korea’s crude steel production stood at 5.5 Mt, up 1.1% on February 2018. In the EU, Italy’s crude steel production for February 2019 was 2.0 Mt, down by 2.7% on February 2018. France produced 1.2 Mt of crude steel in February 2019, a decrease of 0.3% compared to February 2018. Spain produced 1.1 Mt of crude steel in February 2019, an increase of 2.5% on February 2018. The US produced 6.9 Mt of crude steel in February 2019, a 4.6% increase on February 2018. Crude steel production in Ukraine was 1.7 Mt in February 2019, up 5.0% on February 2018. Brazil’s crude steel production for February 2019 was 2.7 Mt, down by 1.7% on February 2018. Turkey’s crude steel production for February 2019 was 2.6 Mt, down by 12.5% on February 2018. SaphyGATE G is the newest radiation portal monitor for trucks, trains and cargo loads control. BIR has informed that former BIR President Jake Farber (President Emeritus, Alpert & Alpert (Los Angeles, USA)) passed away the day before yesterday at the age of 94.